There have been a lot of pissed-off old guys at multiplexes lately—and I’m not including myself after I couldn’t figure out how to work the new bar-code scanning ticket machine at my local AMC theater last night. No, I mean Pierce Brosnan in the disposable-as-a-pair-of-Depends post-007 spy potboiler The November Man (although considering his ludicrous romance with ex-Bond Girl Olga Kurylenko, they should’ve called it The May-December Man), half the cast of the surprisingly entertaining Sin City: A Dame to Kill For (Bruce Willis, Mickey Rourke, Ray Liotta, et. al. ), and the entire cast of the more-fun-than-you’d-ever-expect The Expendables 3 (Sly, Arnold, Wesley Snipes, Harrison Ford, Mel Gibson and on and on). But nobody does pissed-off old guy better than Liam Neeson, at least not since he started putting the Boom in Baby Boomer with the explosively enjoyable Taken movies as well as one of this year’s most underrated films, Non-Stop. Now he’s back as ace mystery writer Lawrence Block’s greatest creation, Hell’s Kitchen ex-cop-turned-unlicensed P.I. 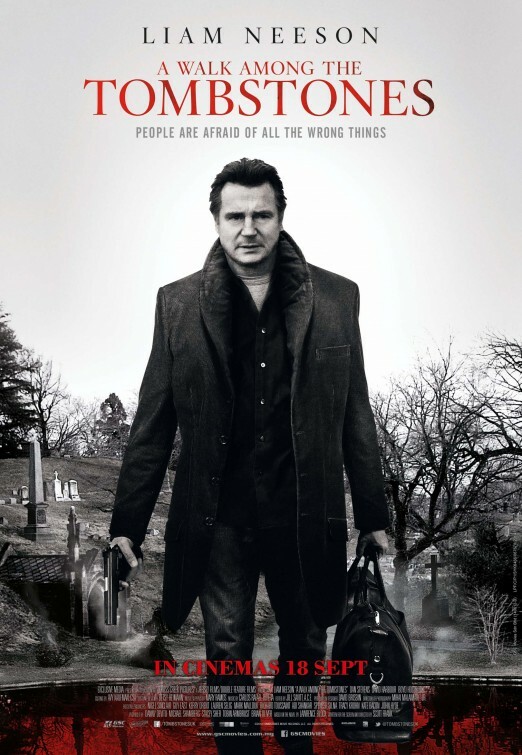 Matt Scudder, in A Walk Among the Tombstones. But, as if the title weren’t a tip-off, this movie is considerably darker than your average geezer revenge flick. As readers of Block’s books know (and as is given away in the trailer, though weirdly not until late in the film), Scudder quit the NYPD after accidentally killing a kid, and he’s a recovering alcoholic who doesn’t always work for the good guys. In this movie, there are no good guys, just bad guys and worse guys. It’s set in pre-Y2K NYC, and Scudder takes a job helping a drug dealer (Dan Stevens, a long way from Downton Abbey, doing a credible American accent) get payback on the psychopaths who kidnapped and killed his wife. Neeson’s a better fit as Scudder than Jeff Bridges was in Hal Ashby’s ill-conceived (transplanted to L.A.!) 1986 misfire 8 MIllion Ways to Die. While the supporting cast could’ve used a female who’s not a victim, it’s still stellar, as Revolutionary Road‘s David Harbour (who’s like Ty Burrell’s evil twin) makes a deeply scary serial killer, ex-X Factor kid-testant Brian “Astro” Bradley redeems the potentially icky role of Scudder’s Sickle Cell Anemia-stricken sidekick, and Ólafur Darri Ólafsson steals the movie as a character even creepier than the monster he played on True Detective. Tombstones won’t be as big of a hit as the Takens or Non-Stop because of its gray morality, but for anyone who likes their shade of neo-noir extra dark, it’ll hit the target. And if not, we’ve got another angry old guy, Denzel Washington’s The Equalizer, coming soon to a theater near you. And I’ll be the first one in line. Just don’t make me use that damn newfangled ticket gizmo! « Can Ryan Phillippe “Reclaim” His Career?